You’ve had pigs in a blanket, but have you taken them to the next level? 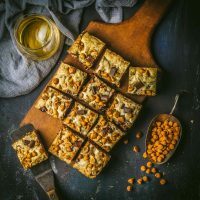 Have you baked them with a pretzel crust and dipped them in a creamy cheddar and stout sauce? Well, we have, and we want to show you how. If you’ve ever been to our house for a party, then you’ve probably eaten our standard Pigs in a Blanket recipe. We’ve never blogged them because they’re super dooper easy – though so much tastier and a boat-load more affordable than the frozen packaged kind. ($10 for a dozen, Costco? Really? Are we doing this now?). We simply cut good quality puff pastry into strips, wrap them around mini hot dogs, egg wash them, sprinkle them with whatever, and bake. Delicious, if somewhat pedestrian. 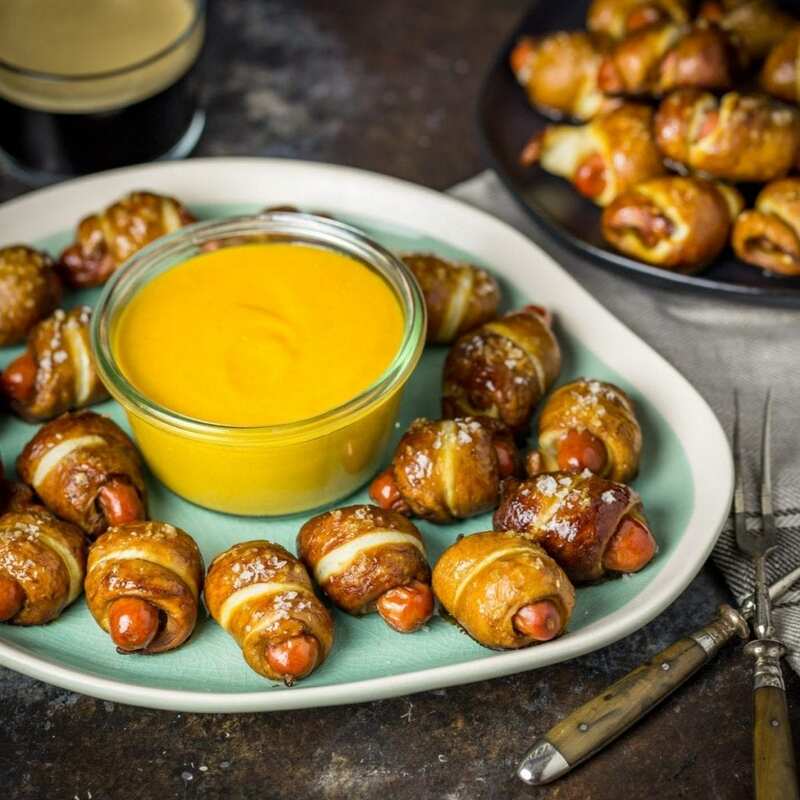 But this year, we wanted to up our party game, so we came up with these: Homemade Pretzel-wrapped Pigs in a Blanket with Warm Cheddar & Stout Beer Dip. Now if that’s not a home run straight through the net, then clearly I don’t know football. While you can substitute store-bought pizza dough, we decided to go the whole nine yards (ha!) and make our own. It’s actually really easy, especially if you have a mixer with a dough hook. All you need is some all-purpose flour, a package of active dry yeast, salt, sugar and little butter. I’m actually quite intimidated by baking but found this to be super easy. Add some warm water (about 115ºF is perfect, so not boiling hot) to the bowl of a mixer (or just a mixing bowl if you’re doing it by hand). Add the sugar and then sprinkle the yeast on top and let it bloom. After about five minutes, it’ll start to get frothy and bubbly and will smell a bit like beer. That’s when you know it’s happy and you can add the flour, salt and butter. Then mix it with the dough hook (or vigorously with a wooden spoon or your hands if you’re not using a mixer) until it pulls away from the sides of the bowl and looks smooth. If it’s still very sticky after five minutes, slowly add a little more flour, about a tablespoon or so at a time, until it loses that stickiness and begins to smooth out and pull away from the bowl. (The exact measure of flour will depend on the temperature and humidity in your kitchen.) The whole process should take about 7 minutes if you’re doing it with a mixer, and maybe 15 or 20 if mixing/kneading by hand). We like to weigh ingredients for baking because it’s more precise. Once the dough is kneaded, place it in an oiled bowl and let it rise until it doubles in size (this should take about an hour). Dough after rising for an hour! Yay dough! Now you can start wrapping the hot dogs (if you’re using pre-made dough, this is where you’d start). We found about a 9-gram chunk of dough was perfect, but you don’t really need to weigh them. Just pull off about a square inch of dough. Roll it into a rope about 6 inches long and wrap it around the hot dogs, with their little ends sticking out. Make sure to pinch the ends of the dough to make them stick together so they don’t unravel when you boil them. Once they’re all wrapped up nice and cozy in their little blankets, they’re ready to be boiled in a water, baking soda and barley malt syrup bath. While the barley malt syrup is optional, it adds a really nice sweetness and gives the dough a head start to that deep brown color. This boiling step is what turns the dough from “bread” to “pretzel”. The alkalinity in the baking soda causes the dough to form the dark, chewy crust we associate with pretzels. 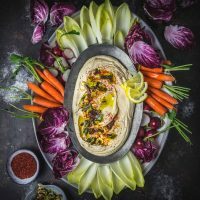 Some recipes call for dipping the pretzels into a cold baking soda bath but the solution won’t penetrate the dough and it will taste more like regular bread but with a dark outside layer. The boiling method will result in a chewier, darker, more pretzel-like dough. NOTE: Culinary lye is often used commercially which is more alkaline than baking soda and it will produce the chewiest crust. Because it’s very caustic and difficult to work with, we’re sticking with baking soda which still gives good results. Quick warning, the pot will froth up like crazy so make sure you use a larger pot than you think you need, and keep an eye on it. Work in batches to keep the pretzels from sticking together. In the photo below you can see the boiled pretzels have puffed up a bit and are darker, after they’ve been boiled but before the baking stage. Boiled and ready for the oven. Once your Pigs in a Blanket are boiled, all that’s left is to brush them with a little egg wash and sprinkle them with whatever you want. We stayed simple with coarse sea salt, but you could use sesame seeds, cracked pepper, poppy seeds or even an “everything bagel blend”. Then bake them until the crust is deep brown, about 10 to 12 minutes. 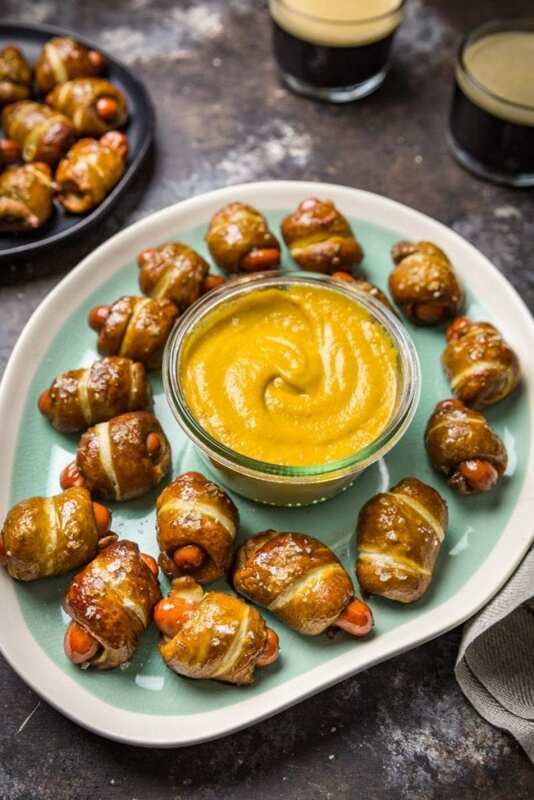 We served our Pretzel Pigs in a Blanket with a warm Cheddar & Stout Dip but good, spicy brown mustard would also be fantastic. And if you’re feeling fancy but not cheesy, you can even make your own Maple Mustard! In a mixer bowl fitted with a bread hook attachment, add the sugar and warm water. Sprinkle yeast on top and let it sit until it starts to foam, about 5 minutes. With the mixer on low speed, add the flour, kosher salt and butter and mix until fully combined. Switch to medium speed, and continue kneading for about 7 minutes until the dough is smooth and pulls away from the edges of the bowl. 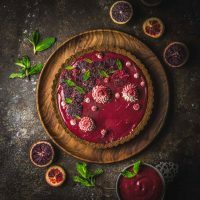 If dough remains sticky after 5 minutes of kneading, keep the mixer on and slowly sprinkle more flour, a half tablespoon at a time, until dough pulls away from the bowl. Rub a little vegetable oil inside another bowl transfer dough to it. Cover bowl with a clean kitchen towel and let it rest until it doubles in size, about 1 hour. 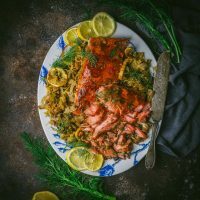 Preheat the oven to 450ºF and set a medium-large pot with 5 cups water to boil. In a small bowl. mix together egg yolk and water and set aside. Line two baking trays with parchment. Pull off a small chunk of dough (9 grams, or about a cubic inch) and roll it into an 6-inch long rope. 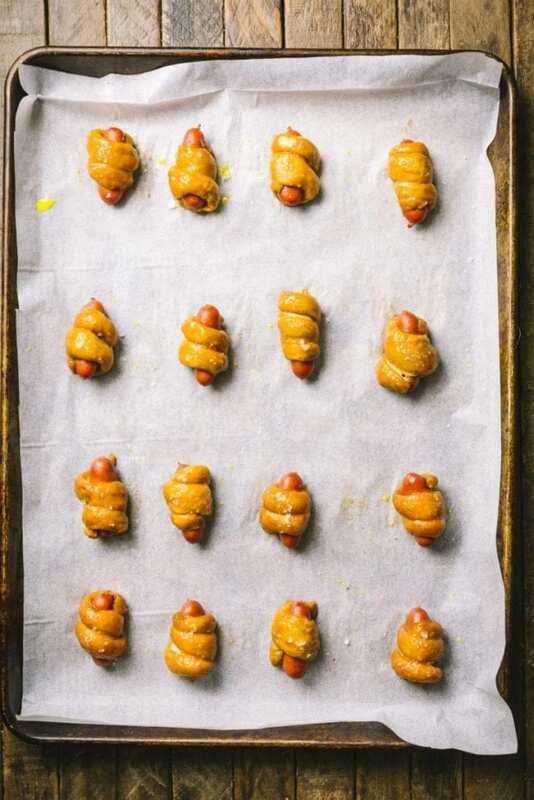 Wrap dough diagonally around a hot dog, leaving the two end poking out. Pinch ends of dough to make sure it doesn’t unravel. Set aside onto the parchment-lined tray and continue wrapping the rest of the hot dogs. Add the baking soda and the barley malt syrup (if using) to the simmering water (be careful, it will foam up). Gently add a third of the wrapped hot dogs into the pot and boil for 30 seconds. Using a slotted spoon, scoop out, shake off excess liquid, and place back onto baking sheet. Repeat with the rest. Brush the top of each wrapped hot dog with the egg yolk mixture. Sprinkle salt on top. Bake for 12 to 14 minutes until dough is deep brown. If using pre-made dough, begin recipe at step 3. And suddenly I’m starving again. These look INCREDIBLE. Perfect for gameday! This. All of this (and the cheese sauce recipe) are making me regret my lunch decisions (grilled chicken salad). I cannot wait to try this!! I’m definitely making these for the super bowl. If you’re taking these to a party, would you boil them at home and then bake them at the party. (My friend doesn’t cook and I have free reign of her oven.) Or would you just bake them at home and keep them warm. I guess what I’m asking is are these better straight out of the oven? Are they still as awesome after they’ve been sitting around awhile? We like these best straight out of the oven, so if you can bake them at the party, that would be best!